Some car companies such as Koenigsegg, Ferrari, Lamborghini, Bugatti are a series of automotive manufacturer brands who renowned diligently to make the high speed cars. This is also supported by the materials used to make the car faster, as well as fiber or carbon fiber. But there is something unique, made by a Canadian man who is also the founder and owner of Pionner Log Homes, Bryan Reids Sr.
As quoted of Autoguide on Tuesday, February 9, 2016, the man who is also the star of the Kings Timber reality show has recently set a Guinness World Record, with the fastest wooden car. 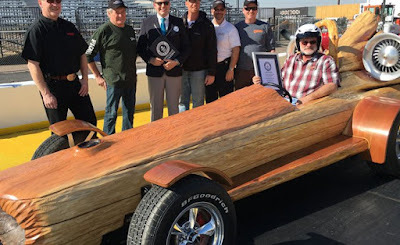 Cader Rocket, that's the name of the fastest wooden car. The car is equipped with two electric turbine that has a power up to 20 hp. On the paper, this car is capable of running up to 140 mph, or about 225 kilometers per hour. For its record on the quarter mile however, it maxed out at 90 mph. The record was set at the quarter-mile track at Wild Horse Pass Motorsports Park in Chandler, Arizona. Nevertheless, the car has a weighs approximately 997.9 kilograms with a quarter of its weight comes from the battery is getting support of the extra power-driven by 35 hp of electric motors. As for this wooden car has apparently been using the chassis, suspension and disc brake of the Mazda RX-8. As for the body of the car, by using red cedar tree of 240 years old, which is then sculpted and measured to make it look more beautiful.